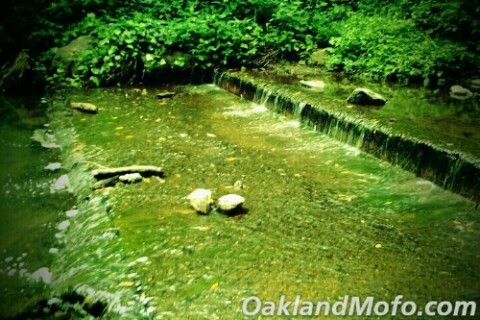 Dimond Park Sausal Creek Trail is a little known trail running along side of Park Blvd in the Dimond Canyon. It starts in Dimond Park and goes along side the creek for a little while under the Liemert Bridge and onto the Montclair Golf Course. It’s a rather short trail as you can see from this map. The Sausal Creek Trail. However it’s very close to home and a beautiful trail. When I was a kid I did this trail a lot in my days of exploring creeks and tunnels. But I recently did this little walk again on an overcast slightly raining misting day and it was pretty awesome and I suggest you do it soon. 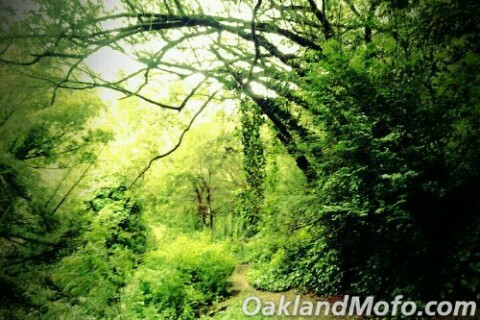 The whole walk down the trail you have Sausal Creek running along side of you. As you walk down the Sausal Creek Trail you are surrounded by a canopy of trees. You really forget you’re in Oakland. At some point you come under the Liemert Bridge which spans high across Dimond Canyon. 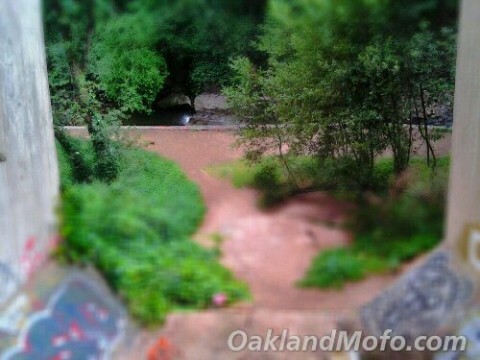 It is located in the Oakmore neighborhood off of Park Blvd up Sausal Creek Trail. It was the largest single span bridge on the West Coast when it was built in 1926. 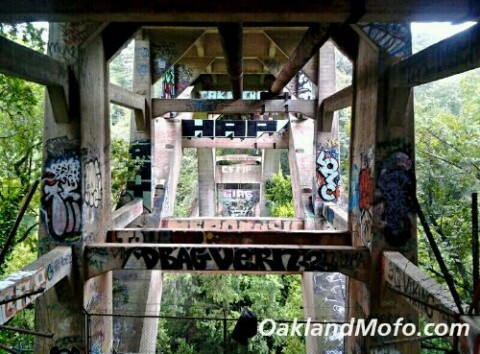 It became a City of Oakland landmark in 1980. 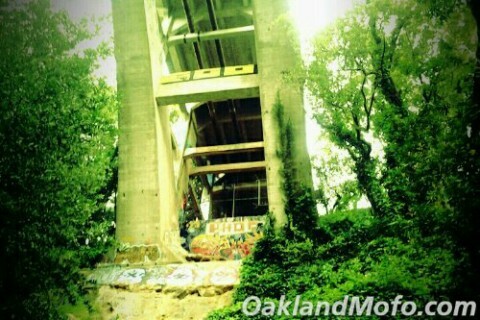 As you can see there is a lot of graffiti under the Liemert Bridge. You can actually climb up the hill to the top of the bridge. I have done this many times as a kid. When you’re a kid things just generally feel bigger. Well I climbed up the bridge as an adult and it still feels really big. Try it, but don’t hurt yourself! And here is a tilt shift picture from the top of the bridge. It’s pretty far down there. So in conclusion you should go check this trail out. Oh and sorry for all the yellow green tinted photos. I was playing with a new Android photo editing app.